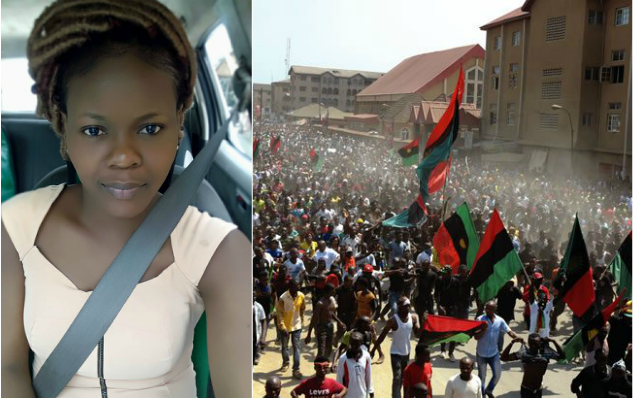 A Facebook user and NHIS officer, Bridget Anurika Eze, took to the platform to narrate how she was harassed yesterday by IPOB members despite being Biafran. MY EXPERIENCE WITH IPOB BOYS TODAY. All my life I have never had a first hand experience of public harassment like today. As part of our normal routine in the office and the scheme at large, we left for facilities inspection at Aba, and off Aba along port Harcourt road. After we were done and coming back, we got to enyimba Junction/bakassi,coman see ipob boys terrorizing people, everyone running for their lives. We kept on moving but slowly and noticed that the road was kinda dry. 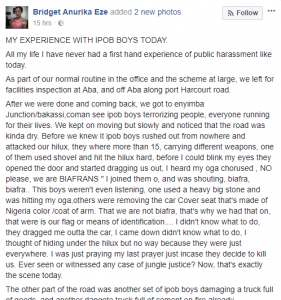 Before we knew it ipob boys rushed out from nowhere and attacked our hilux, they where more than 15, carrying different weapons, one of them used shovel and hit the hilux hard, before I could blink my eyes they opened the door and started dragging us out, I heard my oga chorused , NO please, we are BIAFRANS ” I joined them o, and was shouting, biafra, biafra.. This boys weren’t even listening, one used a heavy big stone and was hitting my oga,others were removing the car Cover seat that’s made of Nigeria color /coat of arm. That we are not biafra, that’s why we had that on, that were is our flag or means of identification…. I didn’t know what to do, they dragged me outta the car, I came down didn’t know what to do, I thought of hiding under the hilux but no way because they were just everywhere. I was just praying my last prayer just incase they decide to kill us. Ever seen or witnessed any case of jungle justice? Now, that’s exactly the scene today. The other part of the road was another set of ipob boys damaging a truck full of goods, and another dangote truck full of cement on fire already. Finally I heard oya enter your motor and run for your life. It was just I, the coordinator, and the driver. I started asking the driver why they allowed us go, our driver said he gave them 500naira that’s why they said we should go. On our way still driving carefully, because they are everywhere, we saw soldiers in their convoy coming down to calm the situation. On entering umuahia, the check points are tight, every living thing except the driver inside a bus, car, keke must come down and raise his/her two hands up to be sure the person isn’t with any weapon. Until there’s a legal/defined way to go about this biafra thingy, there will never be peace. If you haven’t experienced this ipob boys and there madness you will not understand , it’s not about writing epistle on Facebook in the comfort of your home that they should give us biafra this and that. This boys are terrorizing us, their people, the igbos per se. Imagine if they had killed us or any of us. Just like that. Most of this ipob boys are touts, and thieves, I almost forgot to say that they took our drivers phone too. And returned it when he gave them the money. This is too much really. My heart is still heavy. Find attached the selfies I took before and after, u’ll notice the car seat cover that was removed. I couldn’t take pictures of the other scenes because I was scared. I just Thank God we came out of this alive.